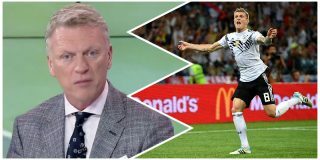 David Moyes was a guest on beIN SPORTS when Richard Keys and Andy Grey asked a series of questions about his experience in the transfer market whilst in charge of Manchester United. United only signed Marouane Fellaini that summer and Moyes accepts the Belgian midfielder was not a top target after revealing United felt they could talk Gareth Bale out of his move to Real Madrid. Moyes reveals he opened dialogue with top midfielders such as Cesc Fabregas and Toni Kroos when he was United manager, with Kroos agreeing to join but in between the Scot lost his job so the deal collapsed. Perhaps I need to be forgiven for not quite buying what Moyes said about Kroos, but this could simply be his version of events at a club who dismissed him after 10 months.